Like a stone structure out of a gothic dream, the Church of San Anton evokes a feel of dark austerity accompanied by serene beauty. Dedicated to Anthony the Great, this beautiful church is an important landmark in the city and appears on Bilbao’s coat of arms alongside the San Anton Bridge. It is a place of worship as well as a place of impeccable architectural artistry and people from many walks of life are drawn to this cathedral. The church was created in the 15th century, and ever since the 1980’s it has been considered a ‘National Historic-Artistic Monument’. 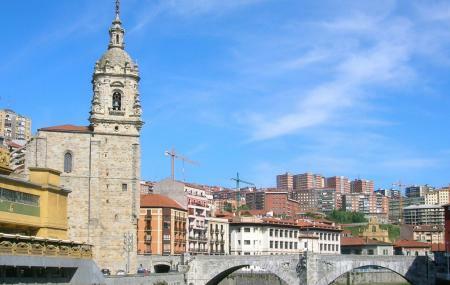 Standing upon a river bank, near the La Ribera market and former city hall, the church is a well known sight. The Church was created in the Gothic style with a single nave but after the city made it larger later, in order to facilitate the increasing number of church-goers in the city. Today, after reconstruction, the church has hints of more architectural styles as well as three naves. Expect to see the Gothic styled building with features from different eras, such as a Renaissance styled facade, a Baroque bell tower, Romanesque rounded arches and a retable and a statue made in the Rococo style. The Chapel of Provost is the original and largest of the chapels within, and has two altarpieces, dedicated to Santa Ana and the Virgen de la Consolacion. A beautiful wooden sculpture, paintings and a silver lamp are across a pretty stained glass window located upon the front wall. The Chapel of Piety has a Gothic structure in the entrance arch and rib vault on the ceiling, all surrounded by coloured sunlight shining in through stained glass windows. The Chapel of San Roque is decorated with a round headed arch sustained by Corinthian columns and a sculpture of San Roque, flanked by Santa Lucia and San Sebastian. Since it’s conveniently located, you can easily fit this church into your day. Call in advance to make sure the church is open. Recommended Time to visit at 07:00 pm. How popular is Church Of San Anton? People normally club together Plaza Nueva and Basilica Of Begona while planning their visit to Church Of San Anton. It was part of a family day out. I enjoy visiting churches so it was interesting for me listen to the audio guide while looking around.